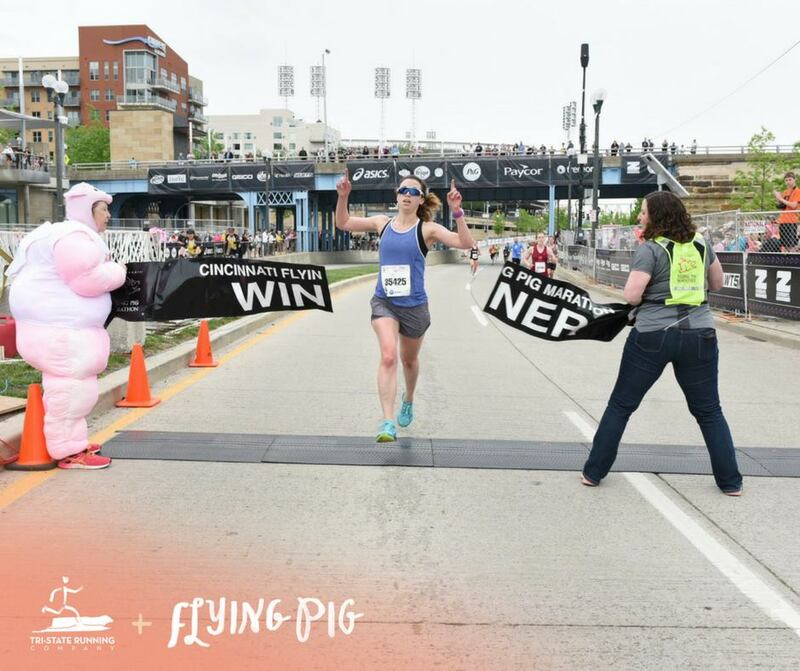 The 20th anniversary edition of the Cincinnati Flying Pig Marathon weekend powered by P&G opened Saturday with a former marathon winner taking home the title in the Tri-State Running Company 5K. Alison Bedingfield Delgado, who won the Flying Pig Marathon in 2005, returned to win the sold-out Tri State Running Company 5K in a time of 19:26. Alison, who is now a pediatrician in Park City, UT, is a former Colerain High and University of Cincinnati graduate whose story of recovery from a near-fatal bicycle accident has been an inspiration for many. Second in the female division is Rita Mayer of Dublin, OH, in 19:29 and third is Marie Wysong of Centerville, OH. Wysong has run several Flying Pig events, coming in second in this year’s Bockfest 5K and in the Toyota 10K in 2016. On the men’s side, Benjamin Spratt of Dry Ridge, KY, won in 17:23. Second was Brian Drapp in Covington 17:44 and third was Ethan Weaver in Erlanger, KY, in 17:56. In the Toyota 10K, Chris Reischel of Cincinnati won in 33:37. Second was Luke Ogden of Cincinnati in 34:01 and third was Marco Pettenazzo of Padova, PA, in 34:19. In the women’s division, 11-year-old Lucia Rodbro burned up the course to win in 42:07. Second was Laura Bill of Grosse Point Wood, MI, in 42:51 and third was Lauren Carnahan of Latham, KY, in 42:59. The 20th anniversary weekend began Friday night with the Little Kings Mile. Winning in the men’s elite division was Jacob Edwards of Delaware, OH, who won the event in 2016, second was Alex Beruscha of Louisville and third was Zach Beavin of Lexington, KY. In the women’s elite division, Flannery Musk from Louisville was the first finisher, with Emma McCarron of Mansfield, OH, second and Lara Crofford, the Little Kings Mile winner in 2016, coming in third.